1. 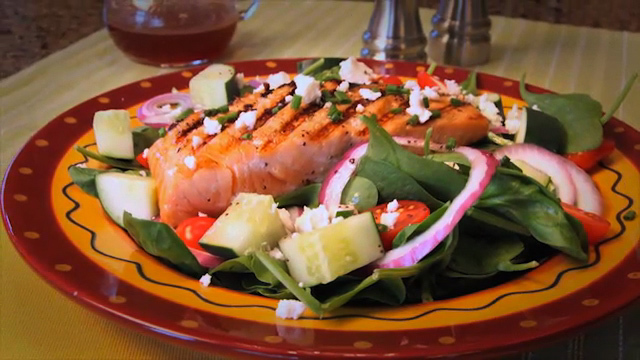 Place salmon in large zip-top plastic bag and pour 1/2 cup vinaigrette over salmon. Seal bag and refrigerate 30 minutes. 2. Prepare outdoor grill for direct grilling over medium-high heat; oil grill rack. Place salmon on hot grill rack, skin side up, and cook 3 to 5 minutes per side, or until internal temperature reaches 145º. Separate skin from salmon while removing salmon from grill. Let cool and refrigerate until chilled. 3. 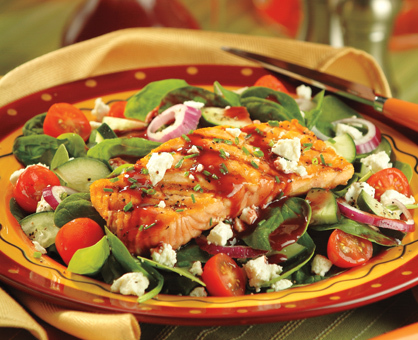 To serve, distribute spinach, onion, tomatoes, cucumber, cheese and salmon fillets over 4 serving plates. Serve with remaining vinaigrette. Garnish with chives, if desired.